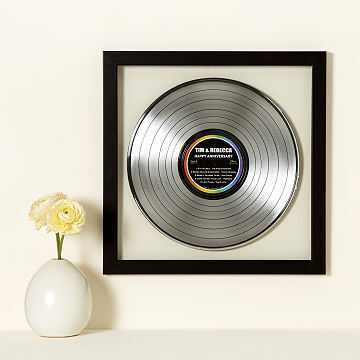 Commemorate a smash-hit moment in your life with this personalized LP wall art made from golden oldies. Made from an upcycled vinyl LP that's finished in a dazzling gold hue and suspended between two pieces of glass in a floating frame, artist Jeff Davis's custom wall art is sure to top the charts at home. The lyrical words you compose for your two-tone label can commemorate a newborn solo act, a romantic duet, or your favorite golden oldies, along with up to five songs with personal resonance. Framed record hand-assembled in Philadelphia. Frame made in USA. This is a made-to-order item. You will receive a proof within 1-2 business days from our custom order team. At that time, you can request a revision or approve the proof. You will be provided with a ship date for the final item after approving the proof. If we do not receive a response within 1 week, your proof will automatically get approved and your order will be put into production. This item typically ships 3 weeks after proof approval.At this time, this item cannot be shipped to P.O. Boxes or to APO/FPO or US Territories. Contact custom@uncommongoods.com with any questions. This is a high quality product! Going to be a conversation piece for years to come! Awesome gift for music lovers. It got rave reviews from friends and family on social media. This product is beautiful, personalized and classy. It is going to look absolutely wonderful when my aunt and uncle hang it up on their wall....and sure to evoke tears upon opening it! My kudos to the designer. A great concept beautifully done. Amzing Gift for any Musician! Amazing gift for a friend who released his first album this year. It looks fantastic and is a tasteful way of showcasing something he put so much time and effort into. He was so happy he cried! Was disappointed that the record would not place song that were picked so....I made a cd of the songs with the recipients wedding picture and a current picture and gave that to them. The coolest, most unique gift! Make sure to put this in a place where everyone will see...a great conversation piece!